↑ "बर्थडे स्पेशल: जानिए क्यों डेब्यू फिल्म के बाद उड़ा था करिश्मा कपूर का मजाक". ज़ी न्यूज़. 25 जून 2018. अभिगमन तिथि 4 नवम्बर 2018. ↑ "10 ऐसे सितारें जो कम पढ़ाई करने के बावजूद भी करते हैं आज बॉलीवुड पर राज". पंजाब केसरी. 25 अक्टूबर 2018. अभिगमन तिथि 4 नवम्बर 2018. ↑ "करिश्मा कपूर ने अपने चाहने वालों को दिया झटका". दैनिक जागरण. 10 अक्तूबर 2018. अभिगमन तिथि 4 नवम्बर 2018. ↑ "बॅालीवुड के इन 3 बड़े एक्टर्स संग जमती थी करिश्मा की जोड़ी, 5 से भी ज्यादा फिल्मों में किया साथ काम". पत्रिका. 21 जून 2018. अभिगमन तिथि 4 नवम्बर 2018. ↑ "बड़ा मज़ेदार है राजा हिन्दुस्तानी का ये 'किसिंग किस्सा', आमिर बता रहे हैं उसकी पूरी कहानी". दैनिक जागरण. 14 अक्तूबर 2018. अभिगमन तिथि 4 नवम्बर 2018. ↑ "करिश्मा कपूर की जुबानी, फिल्मी सफर की पूरी कहानी". द क्विंट. 25 जून 2018. अभिगमन तिथि 4 नवम्बर 2018. ↑ "दीपिका से बहुत पहले ही फिल्म में घूमर डांस कर चुकी हैं करिश्मा कपूर-Navbharat Times". नवभारत टाइम्स. 20 नवम्बर 2017. अभिगमन तिथि 4 नवम्बर 2018. ↑ "श्रीदेवी, रवीना से सोनाली तक, TV पर फ्लॉप रहीं ये 8 बॉलीवुड एक्ट्रेस". दैनिक भास्कर. 27 फरवरी 2018. अभिगमन तिथि 4 नवम्बर 2018. ↑ "करीना कपूर ही नहीं, सलमान खान की 'बॉडीगार्ड' में करिश्‍मा कपूर का था यह 'सीक्रेट रोल'". ज़ी न्यूज़. 3 मई 2018. अभिगमन तिथि 4 नवम्बर 2018. ↑ "Prem Qaidi". Amazon. अभिगमन तिथि 9 March 2018. ↑ "Police Officer". Bollywood Hungama. अभिगमन तिथि 4 June 2016. ↑ "Jagruti". Bollywood Hungama. अभिगमन तिथि 4 June 2016. ↑ "Nishchay". Bollywood Hungama. अभिगमन तिथि 4 June 2016. ↑ "Nishchaiy (1992)". Saregama Movies (YouTube). अभिगमन तिथि 4 June 2016. ↑ "Sapne Sajan Ke (1992)". British Film Institute. अभिगमन तिथि 9 March 2018. ↑ "Deedar (1992)". Rotten Tomatoes. अभिगमन तिथि 9 March 2018. ↑ "Jigar". Bollywood Hungama. अभिगमन तिथि 4 June 2016. ↑ "Anari". Bollywood Hungama. अभिगमन तिथि 4 June 2016. ↑ "Muqabla". Bollywood Hungama. अभिगमन तिथि 4 June 2016. ↑ "Sangram". Bollywood Hungama. अभिगमन तिथि 4 June 2016. ↑ "Shaktimaan". Bollywood Hungama. अभिगमन तिथि 4 June 2016. ↑ "Dhanwan". Bollywood Hungama. अभिगमन तिथि 4 June 2016. ↑ अ आ "Prem Shakti". Bollywood Hungama. अभिगमन तिथि 4 June 2016. ↑ "Raja Babu". Bollywood Hungama. अभिगमन तिथि 4 June 2016. ↑ "Dulara". Bollywood Hungama. अभिगमन तिथि 4 June 2016. ↑ "Khuddar". Bollywood Hungama. अभिगमन तिथि 4 June 2016. ↑ "Andaaz". Bollywood Hungama. अभिगमन तिथि 4 June 2016. ↑ "Andaz". British Board of Film Classification. अभिगमन तिथि 4 June 2016. ↑ अ आ "Andaz Apna Apna". Bollywood Hungama. अभिगमन तिथि 4 June 2016. ↑ "Yeh Dillagi". Bollywood Hungama. अभिगमन तिथि 4 June 2016. ↑ "Aatish". Bollywood Hungama. अभिगमन तिथि 4 June 2016. ↑ "Suhaag". Bollywood Hungama. अभिगमन तिथि 4 June 2016. ↑ "Gopi Kishen". Bollywood Hungama. अभिगमन तिथि 4 June 2016. ↑ "Jawab". Bollywood Hungama. अभिगमन तिथि 4 June 2016. ↑ "Maidan-E-Jung". Bollywood Hungama. अभिगमन तिथि 4 June 2016. ↑ "Coolie No. 1". Bollywood Hungama. अभिगमन तिथि 4 June 2016. ↑ "Paapi Gudia". Bollywood Hungama. अभिगमन तिथि 4 June 2016. ↑ D'Cunha, Zenia (1 November 2015). "Bollywood says boo! Here are top ten 'classic' Hindi horror films to watch this Halloween weekend". Firstpost. अभिगमन तिथि 4 June 2016. ↑ "Megha". Bollywood Hungama. अभिगमन तिथि 4 June 2016. ↑ "Saajan Chale Sasural". Bollywood Hungama. अभिगमन तिथि 4 June 2016. ↑ "Krishna". Bollywood Hungama. अभिगमन तिथि 4 June 2016. ↑ "Jeet". Bollywood Hungama. अभिगमन तिथि 4 June 2016. ↑ "Bal Bramhachari". British Film Institute. अभिगमन तिथि 4 June 2016. ↑ "Sapoot". Bollywood Hungama. अभिगमन तिथि 4 June 2016. ↑ "Raja Hindustani can be taken forward: Karisma Kapur". NDTV. 26 August 2012. अभिगमन तिथि 4 June 2016. ↑ "Rakshak". Bollywood Hungama. अभिगमन तिथि 4 June 2016. ↑ "Ajay". Bollywood Hungama. अभिगमन तिथि 4 June 2016. ↑ "Judwaa". Bollywood Hungama. अभिगमन तिथि 4 June 2016. ↑ "Hero No. 1". Bollywood Hungama. अभिगमन तिथि 4 June 2016. ↑ "Lahu Ke Do Rang". Bollywood Hungama. अभिगमन तिथि 4 June 2016. ↑ "Mrityudaata". Bollywood Hungama. अभिगमन तिथि 4 June 2016. ↑ Jain, Madhu (17 April 2009). Kapoors: The First Family of Indian Cinema. Penguin Books Limited. पृ॰ 315. आई॰ऍस॰बी॰ऍन॰ 978-81-8475-813-9. ↑ Bhattacharya, Roshmila (19 August 2013). "Karisma Kapoor was the 5th choice for Dil To Pagal Hai". The Times of India. अभिगमन तिथि 4 June 2016. ↑ "Silsila Hai Pyar Ka". Bollywood Hungama. अभिगमन तिथि 4 June 2016. ↑ Ashraf, Syed Firdaus (29 May 1999). "Bad show". Rediff.com. अभिगमन तिथि 4 June 2016. ↑ "Haseena Maan Jaayegi". Bollywood Hungama. अभिगमन तिथि 4 June 2016. ↑ "Hum Saath Saath Hain". Bollywood Hungama. अभिगमन तिथि 4 June 2016. ↑ Verma, Sukanya (24 December 1999). "Jaanwar". Rediff.com. अभिगमन तिथि 4 June 2016. ↑ Saha, Aparajita (25 March 2000). "Masala mix". Rediff.com. अभिगमन तिथि 4 June 2016. ↑ Taliculam, Sharmila (6 May 2000). "Not again!". Rediff.com. अभिगमन तिथि 4 June 2016. ↑ Bhattacharya, Priyanka (27 May 2000). "Of Udipi waiters and media princesses". Rediff.com. अभिगमन तिथि 4 June 2016. ↑ अ आ इ "Karisma Kapoor: 10 things you didn't know". The Times of India. 25 June 2014. अभिगमन तिथि 4 June 2016. ↑ Reddy, T. Krithika (15 September 2000). "Film Review: Fiza". The Hindu. अभिगमन तिथि 4 June 2016. ↑ Verma, Suparn (6 October 2000). "Robber? Murderer?". Rediff. अभिगमन तिथि 4 June 2016. ↑ "Shikari". Bollywood Hungama. अभिगमन तिथि 4 June 2016. ↑ Alikhan, Anvar (22 January 2001). "13 thoughts on watching Zubeidaa". Rediff.com. अभिगमन तिथि 4 June 2016. ↑ "Aashiq". Bollywood Hungama. अभिगमन तिथि 4 June 2016. ↑ "Ek Rishtaa — The Bond of Love". Bollywood Hungama. अभिगमन तिथि 4 June 2016. ↑ "Haan... Maine Bhi Pyaar Kiya". British Film Institute. अभिगमन तिथि 4 June 2016. ↑ Verma, Sukanya (20 September 2002). "Run Lolo Run". Rediff.com. अभिगमन तिथि 4 June 2016. ↑ Ganapati, Priya (6 December 2002). "Phoney, predictable". Rediff.com. अभिगमन तिथि 4 June 2016. ↑ Ganapati, Priya (7 February 2003). "A thriller without attitude". Rediff.com. अभिगमन तिथि 4 June 2016. ↑ Pandohar, Jaspreet (28 January 2006). "Mere Jeevan Saathi (My Soulmate) (2006)". BBC. अभिगमन तिथि 4 June 2016. ↑ "Farah Khan wanted Amitabh Bachchan, Dilip Kumar, Saira Banu for 'Om Shanti Om' song". The Indian Express. 17 November 2015. अभिगमन तिथि 4 June 2016. ↑ "5 heroines who made a comeback to Bollywood". India TV News. 8 October 2015. अभिगमन तिथि 4 June 2016. ↑ अ आ Banta, Puja (11 May 2012). "Review: Dangerous Ishhq is regressive on many levels". Rediff.com. अभिगमन तिथि 4 June 2016. ↑ Weissberg, Jay (29 May 2013). "Cannes Film Review: 'Bombay Talkies'". Variety. अभिगमन तिथि 4 June 2016. ↑ "Couldn't have asked for more, Vaibhavi Merchant on Bombay Talkies song". NDTV. 30 April 2013. अभिगमन तिथि 4 June 2016. ↑ अ आ "Karishma: The Miracles of Destiny". TV Guide. अभिगमन तिथि 4 June 2016. ↑ "Bollywood celebrities with flops on television". The Times of India. 23 July 2015. अभिगमन तिथि 4 June 2016. 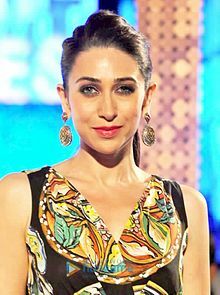 ↑ अ आ "Karisma Kapoor: I may do TV again". NDTV. 1 May 2013. अभिगमन तिथि 4 June 2016. ↑ "'Dance is easier to judge than comedy'". Rediff.com. अभिगमन तिथि 20 April 2017.